Gnostice Document Studio .NET is the next-generation multi-format document-processing component suite for .NET developers. It has controls for viewing, printing, and converting PDF, DOCX, DOC, HTML, TXT, XLSX, XLS, ODS, XPS, BMP, JPEG, PNG, WMF, EMF, TIFF and MTIFF. Gnostice Document Studio comes with advanced multi-format document viewer controls for WinForms, WPF, and ASP.NET (WebForms and MVC). It also supports template-based DOCX/DOC mail-merge document creation. It can intelligently reconstruct page elements when converting PDF to DOCX. It can create PDF portfolios. 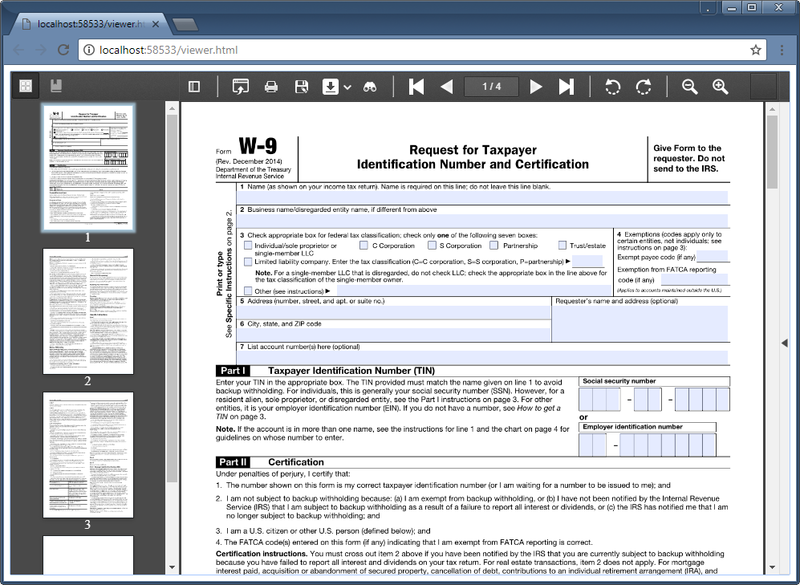 The ASP.NET Document Viewer supports viewing of PDF, DOCX, DOC, TXT, XLSX, XLS, ODS, BMP, JPEG, PNG, WMF, EMF, TIFF and MTIFF files. Unique features of the viewer include searching text in images using OCR, color inversion, and ability to work with all formats with a common GUI and API. PDF support includes interactive form-filling, annotations, thumbnails view, bookmarks view, and general viewing tools. Gnostice Document Studio .NET is based on managed code and does not require external software or libraries such as Microsoft Word, Open XML SDK, Word Automation Services, Adobe PDF library or GhostScript. The OCR feature relies on an embedded unmanaged library. It has been tested completely for trouble-free operation under web, mobile and desktop deployments. The OCR feature can be disabled if it is not required. Gnostice Document Studio .NET is also available as part of our "all-.NET-products-included" Gnostice DevSystem .NET Subscription. 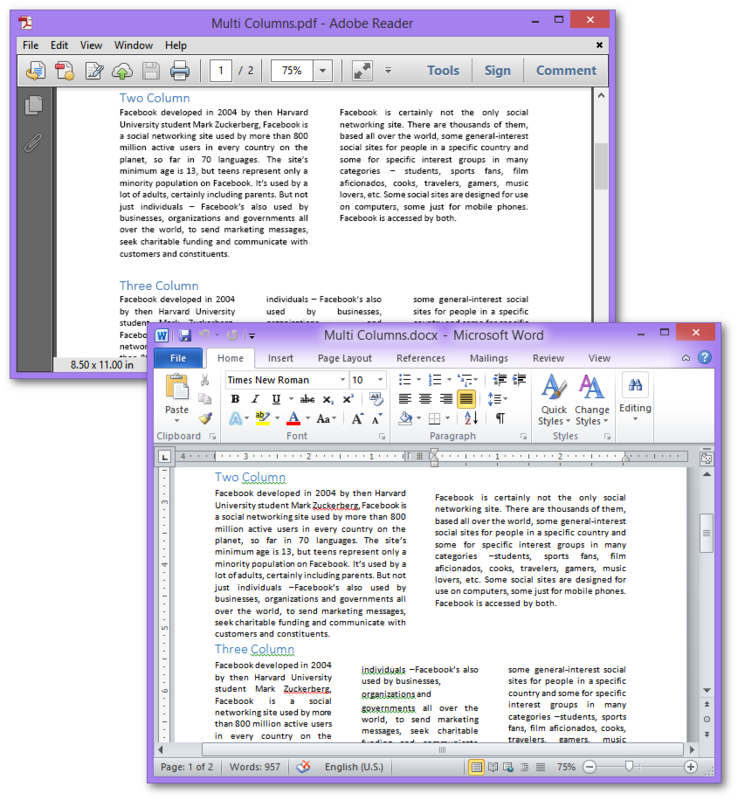 Create a multi-format document viewer in 5 minutes or less! This barebones one took just over one! No software printer. No ActiveX. No Office Automation… No headaches! Intelligently reconstruct page elements such as paragraphs and tables, and content organization details such as page margins, text alignment, etc. - information that are stripped out by PDF converter/generators applications. Display pages in any number of columns and rows! View PDF and DOCX files without leaving Visual Studio. 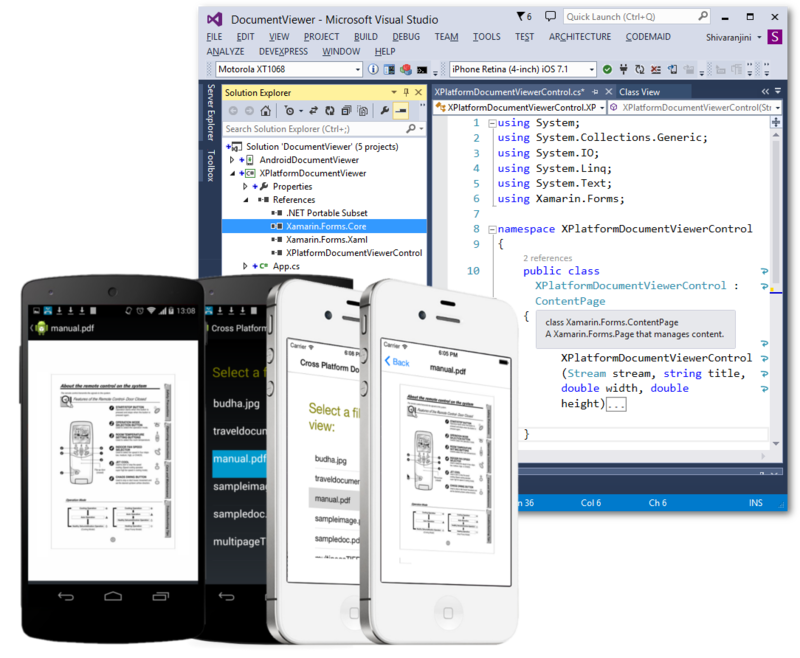 A demo of a Xamarin viewer built using Gnostice Document Studio and StarDocs Document Server. 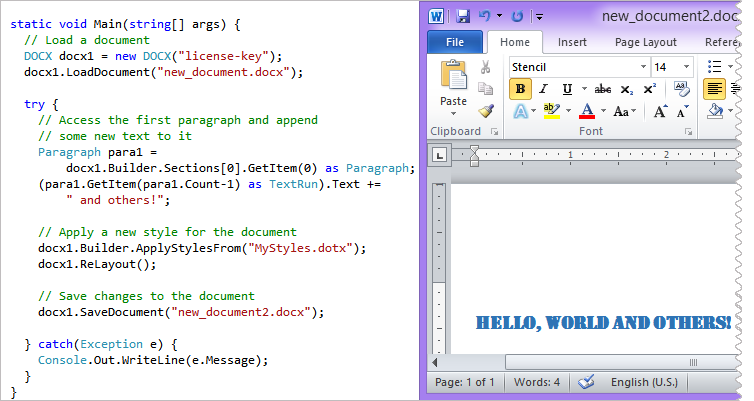 Create DOCX documents from scratch! Read existing documents and add/modify content using DOM-based API or a high-level content-creation API. Gnostice Document Studio .NET is also available on Nuget. You can download any of the files listed in the box below free of charge. Please provide your name and e-mail address so that we can send you information related only to your download. You will not be contacted for any other purpose. We will not give your e-mail address to anyone else in any situation. Please fill up this form and we will mail your license key. You need to use this key in a static method Gnostice.Documents.Framework.ActivateLicense() in your application code. By filling up this form, you will be attesting your acceptance of the Gnostice Document Studio .NET Free Edition SOFTWARE LICENSE AGREEMENT AND LIMITED WARRANTY. Gnostice Document Studio .NET supports the following features. Customizable look & feel - ability to specify rendering resolution, configure toolbar functionality (print, open, download), and visible controls (navigation, page magnification, file operations). Optional client-side printing and file download (as PDF, DOCX, HTML, TIFF). Obtain input from variety of sources - dictionary objects, data objects, etc. Read and write to files and streams. Event support for fine-grained control. Ability to e-mail mail-merged documents. Purchase our developer tools through our online store on share-it! Locate a reseller in your country. All our products are delivered to you electronically. An e-mail regarding the download will be dispatched to you immediately after your payment is received by our online store. The following discounts are applicable for bulk purchases of Developer Licenses. 60% discount off prevailing price if renewal is made within 1 year of expiry of the subscription - new subscription will begin from the day of expiry of the previous subscription. 40% discount off prevailing price if renewal is made after 1 year but within 3 years of expiry of the subscription - new subscription will begin from the day of purchase of the new subscription. 15% discount off prevailing price if renewal is made after 3 years of expiry of the subscription - new subscription will begin from the day of purchase of the new subscription. * - Effective from August 21, 2015. All prices are exclusive of VAT. VAT is applicable based on tax laws in your country. The tax rate will be automatically applied based on rules of the relevant country. New customers: Please find appropriate buy links to our share-it! online store in the tables below. Existing customers: To obtain upgrade/renewal discounts, please send a mail to sales@gnostice.com with details of your last purchase of the product. With the purchase of a developer subscription (for Gnostice Document Studio .NET Ultimate), you also get 12 months free updates and upgrades, and 12 months free priority e-mail support. With the purchase of a developer subscription (for Gnostice Document Studio .NET Desktop), you also get 12 months free updates and upgrades, and 12 months free e-mail support. With the purchase of a developer subscription (for PDFOne .NET and Gnostice Document Studio .NET Ultimate), you also get 12 months of free updates and upgrades, and 12 months free priority e-mail support. For an informed purchase, please consult our License Agreements, and our Licensing and Purchasing Guide. Minor fixes related to setting standard zoom values. PDFException "Improper PDF object Label for object number:: n" thrown if the offset of a PDF object number is 0 in the XRef table or stream. Introduced OCR-based document digitization technology. Rasterized text in scanned images, for example, can be converted to a PDF document with searchable and selectable text. Requires the use of an unmanaged assembly. Currently supports English text. In future, other languages will be supported. Support for converting scanned images in DOCX, PDF, DOC, BMP, PNG, TIFF, and JPG formats to a searchable PDF with selectable text. Introduced DigitizerSettings class to specify settings for converting input documents. DigitizationMode property to specify whether to digitize content. RecognizeElementTypes property to specify content types in input documents that need to be digitized - currently only text elements are supported. OCRSettings property to specify input language - currently only English is supported. ImageEnhancementSettings property to configure image-enhancement techniques and modes for pre-process images before digitization. USE_SPECIFIED_TECHNIQUES - Applies a specified list of image-processing techniques before digitization. AUTO - Automatically determines the combination of image-processing technique(s) that would produce the highest accuracy. OFF - Does not use any image-processing technique before digitization. Scaling - Scales the image dimensions to specified magnification factor. Skew Correction - Detects the skew angle of the image and uses the skew-corrected image for digitization. Graying - Grayscales the image. Image settings with options such as InterpolationMode, CompositingQuality, CompositingMode, and PixelOffsetMode. Password dialog settings which includes built-in password dialog and options such as the count of the number of password attempts. This is available with WinForms/WPF DocumentViewer components and the DocumentPrinter component. Introduced NeedFieldMapping event to handle previously unmapped fields. Masking issues in DCT 8-bpc grayscale RGB images with "decode" array. Text-rendering issues with Type-1 embedded fonts in German locale. Form/XObject streams were not rendered in German locale. Handling of Form XObject streams was slow in German locale. Issues in decompressing Flate-encoded streams with different predictor values. Images were not rendered for documents whose MediaBox values appear in an order other than [Left, Bottom, Right, Top]. Support for Visual Studio 2015. Introduced uploadDocumentFromBuffer function to load a document from a Base64 string. Introduced afterDocumentUpload event to get notified when a document gets uploaded to the server. CONVERT_TO_SINGLE_FILE - Converted documents are merged into a single file. CONVERT_TO_SEPARATE_FILES - Documents are converted to separate output documents. CONVERT_FIRST_FILE_AND_ATTACH_REST_AS_ORIGINAL - Only the first document is converted and the rest of the documents are embedded in it as attachments. CREATE_NEW_FILE_AND_ATTACH_ALL_AS_ORIGINAL - A new blank document is created and all documents are embedded as attachments in it. Existing convertToFile and convertToStream methods that accept mergeAfterConvert boolean parameter are deprecated. when to create a portfolio using new PortfolioCreationMode enumeration. how documents are laid out using new PortfolioLayoutMode enumeration. Introduced support for TextBox elements. DCT images with stencil masking with decode array were inverted. Errors in decompressing Flate-encoded streams with predictor value of 12. Available as a "Quick Find" control on the floating toolbar. Gets activated for "Ctrl+F" keypress event. specify highlight color of search results. Toggle option to show cover page individually. Added a full-featured viewer demo. Support for tables inside text boxes. Support for nested text boxes. Optimized loading and rendering speed for files with embedded fonts. Added support for stencil masking for 8-bpc DCT grayscale images. After the state of a check box is modified, the form field is displayed in viewer applications with a '4' character instead of a tick mark. Introduced support for customizing keyboard shortcuts using new KeyBindings property in Gnostice.Documents.Framework class. Type casting exception is encountered sometimes when image dictionary attributes are referred using "IndirectReference" objects. Type-1 images with ImageMask are not rendered. PDF - Support for Type1 image with CMYK colorspace, when the valid colors are not specified. Internal redesign for instant loading, fast scrolling through pages and handling of large* documents. Improved buffering logic for memory efficiency. Internal redesign for instant loading and handling of large* documents. "HandlerUri" property to specify ASP.NET handler for generating the content for the viewer control. Improved initial document-loading speed for large* documents. Support for rendering DCT images with 1-bpc DeviceGray masking. PDF: Dots were missing when moveTo and LineTo points are same while drawing a line. DOC/DOCX: Minor issues in rendering. * - Test samples included documents created by merging multiple document copies to get file sizes over 150 MB and page numbers over 15000. Samples included specification documents for OpenXML and PDF. Introduced "DocumentCache" property to specify whether to cache input document to disk or memory. Introduced "DiskPath" property to specify folder where input documents are cached. Introduced "Document" dependency property to specify input document to display in the viewer component. Accepts input document as file, stream or byte array. Support for rendering of CCITT images with Indexed-RGB, CMYK and GrayScale colorspaces. Support for images using "Separation" colorpace with alternate "Lab" colorspace and tint-transform functions. Higher DPI images increases displayed page size. "download" and "downloadAs" operations omits file extension of output file in some cases. GDI+ exception encountered while rendering high-resolution documents. Clicking toggle menu refreshes the page in mobile mode. PDF: Some text elements are not rendered when whitespace characters precede their encoding in the PDF. Images were not disposed after conversion. Duplicate pages introduced when converting from TIFF file format. Validation support for value entered in "Goto Page" box. Added "Full screen" control to toggle full screen display mode. downloadAs() API to convert and download the uploaded document to a desired format - PDF, DOCX, HTML, TIFF. Optimized loading of huge documents. Optimized loading of huge multi-frame TIFF images. Introduced "EmailAction" class to support e-mailing mail-merged documents. Ability to e-mail the document to specific recipients. Ability to specify To, From, CC, BCC, Subject, Body, and other file attachments. Ability to specify placeholders which can be dynamically replaced at the time of sending e-mail. Event support - BeforeSend, AfterSend. Option to send mail-merged content in the body or as attachment. Option to encode the body as HTML. Standard zoom not applied correctly in some instances. Print animation continues to be shown after issuing print command. "Goto Page" box accepts out-of-range page numbers. PDF - Some text elements are not rendered when white-space characters precede their encoding in the PDF. PDF - "ASCIIHexFilter" decoding issues. Introduced support for converting from PDF, DOCX, and DOC to text. Option to specify encoding (such as UTF-8) for the output text file using TextEncoderSettings.setFileEncoding(). Option to specify whether BOM (Byte Order Mark) needs to be set. Options to specify whether to add breaks such as line feed, paragraph break (double line feeds), form feed and file-separator character (0x1C). Option to specify whether to add a page break marker (by default, set to "-- End of Page --"). Introduced support for converting from PDF, DOCX and DOC to HTML. Introduced redesigned (out-of-beta) MailMerge class to provide greater flexibility and more user-friendly APIs. Add, edit or delete merge-field mapping using APIs provided in FieldMapping class. Option to remove empty merge-field containers. Option to break for a merge output instance using MailMerge.MergeInstanceBreakType - create a new document, page, or paragraph. Display and print documents in ASP.NET Web applications (use "empty" template). Supported formats: PDF, DOCX, DOC, TIFF, JPEG, BMP, PNG, EMF and WMF. Fully customizable user-friendly toolbar with controls for file operations (open, download, print), page navigation, displaying page number/page count, and changing page magnification. UI customization support with CSS. Load documents from files and streams. Ability to configure look & feel - Specify rendering resolution, toggle enabled functionality (print, open, download), and visible controls (navigation, page magnification, file operations). New DPI property in ImageEncoderParams class to set the pixel density of the output image. New "Free" edition introduced - includes the multi-format WinForms document viewer component with full functionality of the current version. Options to specify output to stream or file. Option to map merge fields to data source columns. Option to remove empty field containers. Event support for inspecting, updating, removing or skipping fields. Introduced MailMerge class to perform mail merge operation in DOCX files. Support for tables in headers and footers. Support for tables with columns extending beyond page margins. Support for rendering images stored in legacy VML format. Introduced PDFVersion property in the PDFEncoderParams class to set the PDF version of the output document. Several fixes related to reading PDF object stream. Several issues related to font-processing. Incorrect rendering of text with tabs containing decimal alignment. Incorrect pagination when rendering some documents. Text highlighting is lost during conversion from DOCX to PDF. Some Unicode and "Symbol" font characters are lost during conversion from DOCX to PDF. Displays and prints documents in ASP.NET MVC web applications. 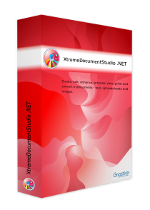 Supports PDF, DOCX, DOC, TIFF, JPEG, BMP, PNG, EMF and WMF formats. Customizable user-friendly floating toolbar for displaying page number and page count, saving and printing documents, and navigating pages. Support for custom themes (CSS files) using Theme property. Specify HTML DOM object ID using ClientObjectName property. Use properties to configure toolbar buttons, position, appearance; scrollbar options; viewer background color. Get page number and page count of loaded document. Get and set printing resolution. Call methods to navigate pages, save document, print document, zoom in and zoom out. Listen to add_PageChanged event to handle current page-change events. Introduced support for PDF (in addition to existing support for DOCX, DOC, TIFF, JPEG, BMP, PNG, EMF and WMF formats). 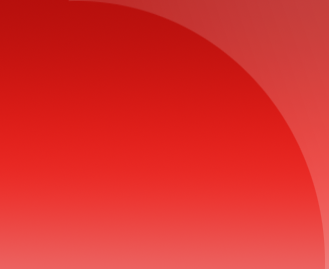 PDF: Optimized and faster loading with improved fault tolerance. Introduced Gnostice.Documents.Framework class to enable single-point license activation. Removed license activation methods in all controls. Individual instance-level activation is not required now. Displays and prints documents in ASP.NET WebForms applications. PrintDocument method in the Viewer control prints asynchronously and does not block UI thread. Introduced DocumentPrinter control for printing documents (PDF and DOCX) and images. AutoRotate property to automatically re-orient rotated pages. PageScaling property to automatically resize pages to suit output paper size. Set vertical and horizontal page position on output medium. PrintDocument property for access to a System.Drawing.Printing.PrintDocument object to gain complete control over printing process - set margins; use with PrintPreviewDialog and PrintPreviewControl; enables creation of a custom "PrintController" class or a custom PrintDocument-derived class. Handle BeginJob and EndJob events to get notified when a conversion job starts and ends. Handle BeginPreparePage and EndPreparePage events for page-level conversion job notifications. These events expose a graphics object which can be used to render your own content on pages such as watermarks and overlays. Use NeedPassword event handler to supply password to decrypt encrypted documents. Support for printing in non-GUI scenarios such as console applications. Support for converting documents to a single output file. Input documents can be specified using a list of streams, list of file pathnames, or a single stream or a single file pathname. Support for specific conversion settings for individual documents in a single conversion job. Events to cancel or skip documents or pages; provide filenames or output streams for converted documents; obtain notifications of various stages in the conversion job; provide password for decrypting encrypted documents. Demos are categorized according to platform first and then according to language. Different solution files are included for easily loading required demos. AllDemos.sln contains all demos including those for WinForms, ASP.Net, etc. WinFormsDemos.sln groups all WinForms demos. DocumentManager has been changed from a control to class. DOCX: Random hanging issues with rendering DOCX files created by applications other than Microsoft Word. PDF: Viewing page reordering issues with some incrementally updated files. Added support for Microsoft Visual Studio 2013. The license agreements governing the use of this product are given below. For additional understanding of the agreements, please refer to our licensing and purchasing guide. Our Aim: The license agreements are intended to be fair to both our customers and the team that made the products. Hence, they safeguard the interest of all stakeholders while keeping the terms simple and straightforward. Broad range of applications our customers make. For Development: Get one DEVELOPER SUBSCRIPTION for each developer. With one DEVELOPER SUBSCRIPTION, a developer can install the GNOSTICE PRODUCT in one desktop and one laptop that the developer uses. For installing on additional computers, buy additional DEVELOPER SUBSCRIPTIONS. Developer licenses are available at discounted prices for purchase quantities greater than 4. Larger teams are recommended to buy the 5-Developer, 10-Developer and 25-Developer Subscription Licenses. To develop/test/deploy/distribute most kinds of software applications using this product, you need a DEVELOPER SUBSCRIPTION, one for each developer or additional computer. No additional royalty would be required. If the software that you are creating is a developer tool and exposes functionality provided by the GNOSTICE PRODUCT using an application programming interface (API) (say a component library or a Web API), then get an SDK LICENSE in addition to your DEVELOPER SUBSCRIPTION(s). You need to mail us describing your product. If the software that you are creating is a developer tool (say an IDE) AND bundles the GNOSTICE PRODUCT in a non-compiled form, then get an OEM LICENSE in addition to your DEVELOPER SUBSCRIPTION(s). You need to mail us describing your product. If you are a student and want to use the GNOSTICE PRODUCT for your project work, then you can get the low-priced STUDENT ACADEMIC LICENSE instead of the more expensive DEVELOPER SUBSCRIPTION. You need to mail us describing your project. Non-Profit Organizations: Giving discounts for non-profit organizations requires us to be judgemental about their intentions and practices. For this reason, we provide discounts only to students and educational institutions. It requires limited scrutiny and involves no discrimination. This is a convenient policy and we would like to stick with it. Please excuse us if you are a non-profit looking for a discount. We will not be able to help you in that regard. License Enforcement Techniques: When installing the GNOSTICE PRODUCT, the installation program may require an Internet connection. Get discounts on volume purchases. Pay only 40% of the prevailing price for renewals within 1 year of expiry; 60% if more than 1 and less than 3 years of expiry; 85% if more than 3 years of expiry. Upgrade to parent-product bouquets without losing money - pay only the difference - if upgrade is made within one year of expiry. Free major and minor updates for 12 months. Free e-mail support for 12 months. A Gnostice Document Studio .NET developer subscription comes with free priority e-mail support for 12 months. Please send your queries to support at gnostice.com. Please ensure that your mail system does not block e-mail from our domain gnostice.com. (Our support system will send you an autoresponder within a few minutes of your e-mail.) You can also use our online feedback form to send us support queries. A Gnostice Document Studio .NET developer subscription comes with free updates (major and minor) for 12 months. Our news page provides information on the latest updates to our products. You can also subscribe to our news RSS feed to get notified of the latest updates. The installer program will also create a local copy in your computer when you run it. We have also published technical articles related to Gnostice Document Studio and other Gnostice developer tools, as part of Gnostice Newsletter. To subscribe to the newsletter, send a blank e-mail to info@gnostice.com with the subject set to "SUBSCRIBE". You can also get notified of the latest articles via our newsletter RSS feed. Learn more about the major new features available in v19.1 and to be released in the v19.2 release of Gnostice Document Studio .NET. Add watermark to the document pages during view and print operation. Learn how to interact with PDF files using annotations in ASP.NET Document Viewer control. Learn to use Document Studio .NET’s Document Converter. Learn how to enable form filling in the ASP.NET Document Viewer control. Learn to use the new ASP.NET Document Viewer control in Document Studio .NET. Learn to display server-side documents and print without preview. Learn how to enable logger. Learn to convert your documents to web pages in C# without using Office Automation or unmanaged code. Video demos of the new features. Learn to use the new digitization feature of Document Studio .NET. 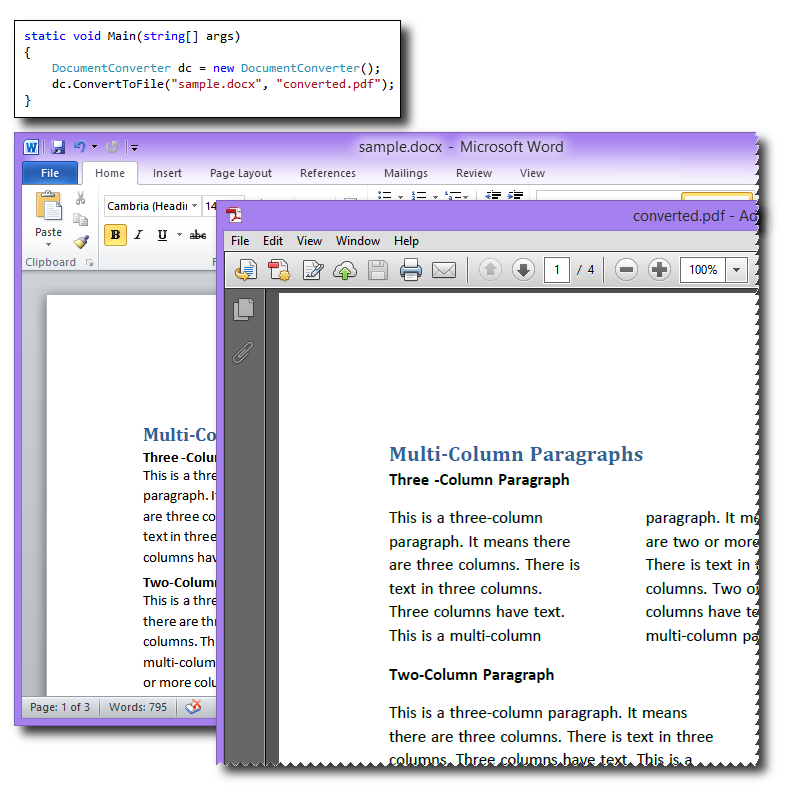 A free Visual Studio extension for viewing DOCX, DOC and PDF files from within the IDE. Learn to use the new "EMailAction" action class. Learn to create PDF portfolios using Document Studio .NET. Learn about the new Document Studio .NET edition that is totally free! Learn to do this with DocumentViewer and DocumentPrinter controls of Document Studio .NET. Learn to use the latest mail-merge functionality in Document Studio .NET. 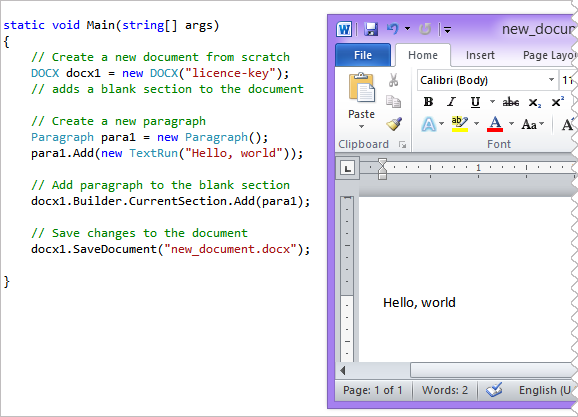 Learn to create a simple multi-format document-printing application in C#. 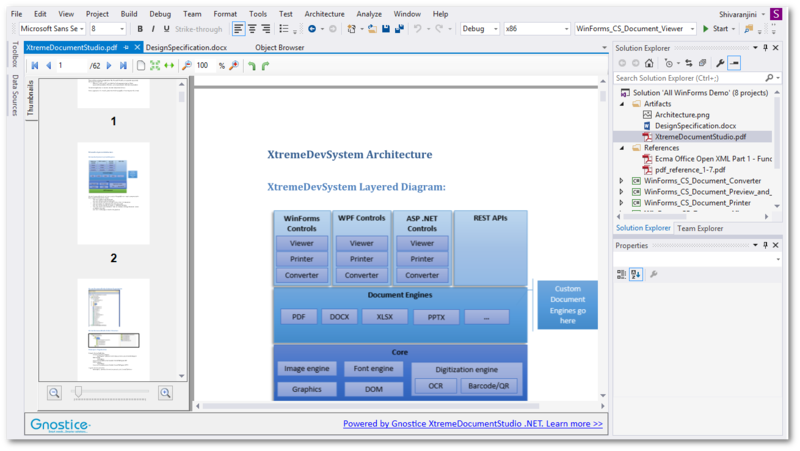 Learn to use Document Studio .NET's WPF document viewer control. No software printer. No ActiveX. No Office Automation… No headaches! Just a few lines of C# to convert DOCX to PDF. Display and print DOC, DOCX, XLS, XLSX, ODS, PDF, BMP, PNG, JPG, WMF, EMF and (single-frame and multi-frame) TIFF files using C#.